The market jute bag is the largest jute bag in our lineup, and is ideal for filling with fresh fruit and vegetables on a sunny day at the market, or for carrying towels to the beach. The listed print dimensions for this product are 300mm wide, but contact us if you'd like to go wider and we can take a look at your artwork to see what's possible. Generous shoulder handles make it possible to carry the bag over your shoulder and tucked under your arm, even when fully loaded. 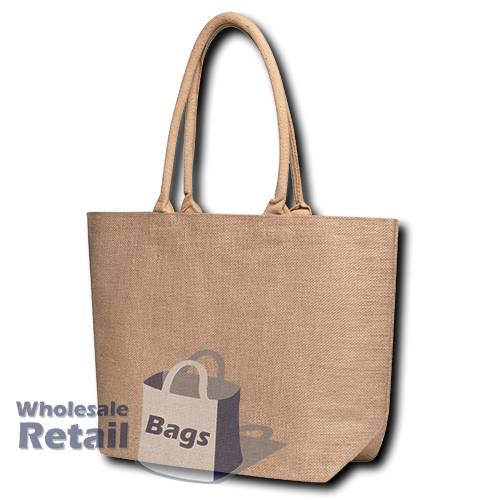 The next size down from the market jute bag is the basic jute bag, but it does not come with a gusset and doesn't have the oversize shape of the market jute bag.